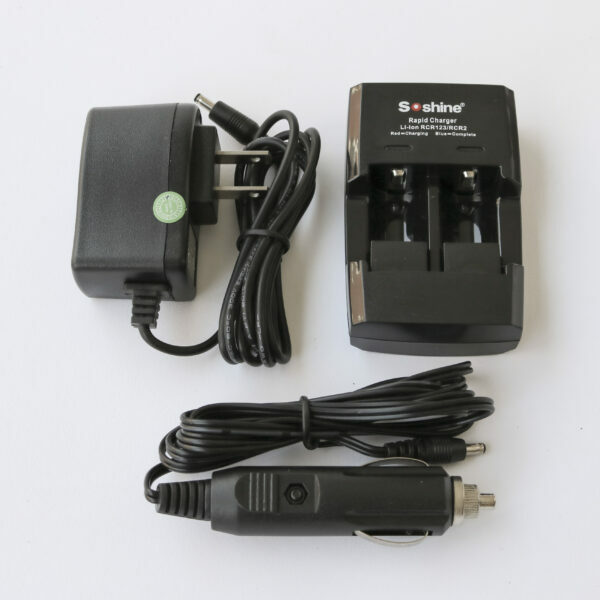 Soshine Charger used to recharge lithium ion rechargeable batteries compatible with the older microFET®, product line and ergoFET™ product line. This charger is used for the older models which required you to take out the batteries from the device and place inside the charger. Before ordering please make sure your device is compatible with this charger, Any questions or need help please contact us? Function: Soshine Li-ion RCR 123 / CR2 battery intelligent rapid charger. – End-of-charge voltage detection assures the safe and full charge any time. – Over voltage cut-off protection to prevent your batteries from over voltage. – Complete individual channels to prevent the two batteries from charging each other. – CC / CV charging method to charge batteries fully and quickly. – Reverse polarity protection to prevent damage to your battery and charger. © 2017 Hoggan Scientific, LLC. All rights reserved.